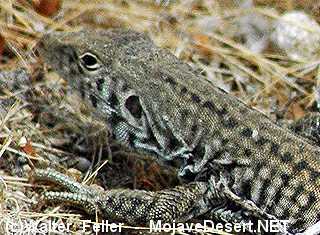 The western whiptail is widely distributed but uncommon over much of its range in California, except in desert regions where it is abundant in suitable habitats. The species is found throughout the state except in the humid northwest, along the humid outer Coast Ranges, or mountainous regions above 2290 m (7500 ft). Also absent from much of the northern part of the Central Valley (Montanucci 1968). The western whiptail occurs in a variety of habitats including valley-foothill hardwood, valley-foothill hardwood-conifer, valley-foothill riparian, mixed conifer, pinyon-juniper, chamise-redshank chaparral, mixed chaparral, desert riparian, desert scrub, desert wash, alkali scrub, and annual grassland. Whiptails forage actively on the ground near the base of vegetation taking a wide variety of ground-dwelling invertebrates including grasshoppers, beetles, ants, termites, insect larvae, and spiders (Stebbins 1954). Individuals often probe cracks and crevices and dig in loose soil as they forage. Whiptails occasionally appear to stalk larger prey items such as grasshoppers. Individuals have been observed breaking up termite galleries in dead vegetation. Vitt and Ohmart (1977) reported that the diet of whiptails may change seasonally to reflect the abundance of seasonally available prey items. Whiptails are always most common in and around dense vegetation. They spend little time in open areas but will cross barren spaces in order to reach the cover of dense shrubs in sparsely vegetated areas. Initially they rely on speed or the cover provided by dense vegetation to avoid predators, but if pursued they will eventually seek refuge in burrows. Little is known about habitat requirements for courtship, mating, and egglaying. Loose soil for foraging and nest construction may be an important habitat element. No information on water requirements. This species is widely distributed in arid regions and does not require permanent water. Whiptails are always most common in and around dense vegetation. They are often found associated with sand areas along gravelly arroyos or desert washes (Stebbins 1954). Activity Patterns: Whiptails are primarily diurnal. In the deserts most activity occurs in the morning (Vitt and Ohmart 1977) except on cloudy days when individuals may be active all day. In northern California where summers are milder, the peak of activity occurs about midday (Johnson 1969). Adult whiptails usually become inactive by early fall, but juveniles extend the period of activity until late fall or even early winter depending on local conditions. Pronounced seasonal movement or migration has not been reported for this species in California. Most or all essential habitat requirments are apparently found within the normal area of activity. When long-distance movements do occur they are unpredictable and related to food availability. Average home ranges for whiptails (excluding wandering individuals) have been calculated by Milstead (1957) to be about 0.1 ha (0.26 ac). Jorgensen and Tanner (1963) have reported home range sizes of 0.07 ha (0.18 ac) for males and 0.04 ha (0.10 ac) for females. Parker (1972) reported densities of whiptail lizards in the Sonoran Desert of Arizona to vary from 13-36/ha (5-15/ac). In Nevada Tanner et al. (1969) observed densities ranging from 7-19/ha (3-8 ac). Observed overlaps in the home ranges of adult whiptails, coupled with an apparent lack of aggressive behavior between individuals, have suggested to some workers (Milstead 1957, Parker 1972) that there is a lack of male territoriality in this species. The reproductive season for the western whiptail varies geographically and from year to year depending on local conditions. Reproductive behavior generally occurs from May to August. Parker (1972) reported the average clutch size to be 2.9 eggs with a range of 1-5. It is possible that females from the southern California desert regions may lay more than one clutch of eggs per year (Pianka 1970). Vitt and Ohmart (1977) suggest that the active, constantly moving behavioral pattern of whiptail lizards makes them subject to a high frequency of predation attempts by diurnal predators. Such predators include snakes, larger lizards, and predaceous birds. Ohmart (1973) found that whiptails make up a large percentage of the food items consumed by roadrunners. Although the food habits of western whiptails at times overlaps considerably with those of the zebra-tailed lizard (Vitt and Ohmart 1977), competition for food may be minimal since most of the dietary overlap is attributable to the common utilization of seasonally abundant prey. Different foraging microhabitat preferences by the two species further reduce competition where they coexist. Johnson, C. R. 1969. Observations on northern california populations of cnemidophorus tigris (Sauria: Teiidae). Herpetologica 25:316-318. Jorgensen, C. D., and W. W. Tanner. 1963. The application of the density probability function to determine the home ranges of uta stansburiana stansburiana and cnemidoporus trigris tigris. Herpetologica 19:105-115. Milstead, W. W. 1957. Observations on the natural history of four species of the whiptail lizard, cnemidophorus (Sauria: Teiidae) in Trans-Pecos Texas. Southwest Nat. 2:105-121. Montanucci, R. R. 1968. Notes on the distribution and ecology of some lizards in San Joaquin Valley, California. Herpetologica 24:316-320. Ohmart, R. D. 1973. Observations on the breeding adaptations of the roadrunner. Condor 75: 140-149. Parker, W. S. 1972. 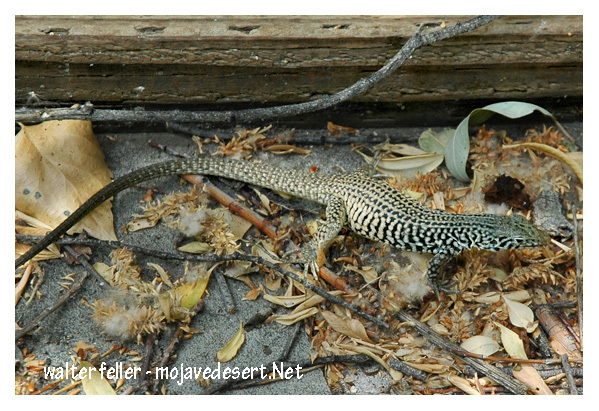 Ecological study of the western whiptail lizard, cnemidophorus tigris gracilis in Arizona. Herpetologica 28:360-369. Pianka, E. R. 1970. Comparative autecology of the lizard cnemidophorus tigris in different parts of its geographic range. Ecology 51:703-720. Tanner, W. W., et al. 1969. Vitt, L. J., and R. D. Ohmart. 1977. Ecology and reproduction of lower colorado river lizards: ii. Cnemidophorus tigris (Teiidae), with comparisons. Herpetologica 33:223-234. Cnemidophorus tigris multiscutatus - USGS Western Ecological Research Station, San Diego Ca. The western whiptail is widely distributed but uncommon over much of its range in California, except in desert regions where it is abundant in suitable habitats. Distinguishing characters: A species with eight light-colored stripes that are often very indistinct, with crossbars in adults suggesting checkered appearance; dark markings on dorsum with yellow, tan or brown background; throat pale with black spots; long tail; enlarged, square scales on venter; dorsal scales fine and granular; tongue is forked and flicked continually. Juveniles: Similar to adults, with distal portion of tail bright blue-green; in Orange and Riverside Counties they are striped. Dimorphism: Enlarged femoral pores in males. Similar species: Cnemidophorus hyperythrus: Striping more distinct; does not appear checkered or spotted; legs and tail cobalt blue in juveniles. Additional notes: A distinctive species with a jerking gait, rarely sits still. Adults are surprisingly strong when handled and have very sharp claws. Whiptails belong to a large family of New World lizards, distributed throughout the West Indies and South America. Only fourteen species of the genus Cnemidophorus reach into the United States, so we are very much at the edge of their range. They eat insects, spiders and other small animals. Some whiptails are very unusual in that their population consist entirely of females. The females lay viable but unfertilized eggs, that develop into genetically identical females. In some of the Cnemidophorus species, males are not required for the females to reproduce. This is called parthenogenesis. This is very rare in vertebrates. The species capable of doing this are a hybrid of a mating between a female of one species and a male of another. This will occasionally produce a parthenogen, a female that is able to produce viable eggs that are genetically identical to her own cells. The offspring from these eggs are also parthenogens that can produce genetically identical eggs, resulting in an asexual, clonal population.